Wednesday September 9th 1896 Mother and I put up the peaches and got an early dinner for ourselves as Charlie was helping Hankies thresh. We took the Ashleys some apples and went down to see Mollie Robinson she was not at home. Mother brought a bushel of peaches and she staid to help up them up and Lee Came home with me. I ead in the evening after my work was done. Thursday September 10th 1896 Charlie helped me some about the washing this morning. Mrs Luse was out to get some apples. It rained in the afternoon so Lee ad I could not go in \town so I did the ironing. I had Charlie go in for what I wanted. I read in the evening. 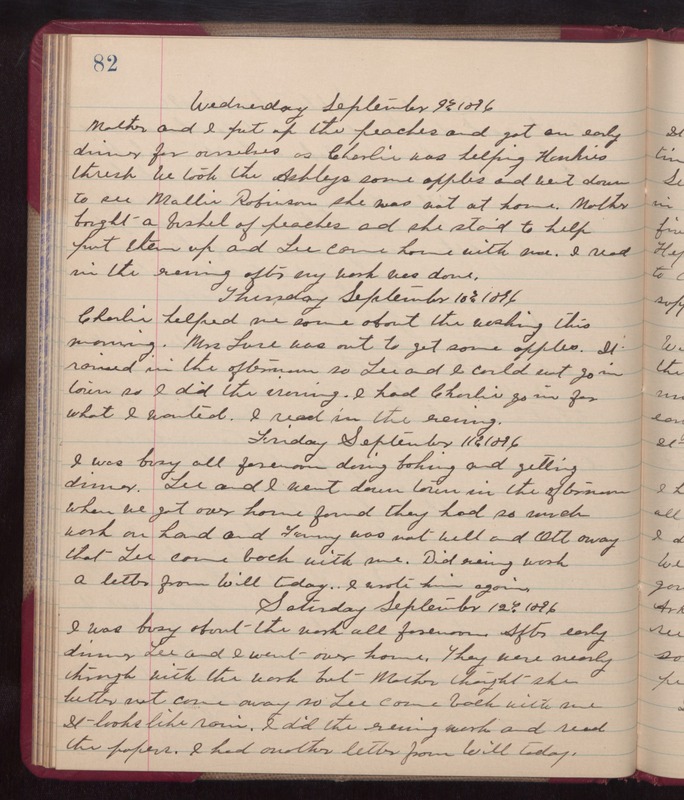 Friday September 11th 1896 I was busy all forenoon doing baking and getting dinner. Lee and I went down town in the afternoon when we got over home found they had so much work on hand and Fanny was not well and Ott away that Lee come back with me. Did evening work. a letter from Will today. I wrote him again. Saturday September 12th 1896 I was buys about the work all forenoon. After early dinner Lee and I went over home. They were nearly through with the work but Mother thought she better not come away so Lee come back with me. It looks like rain. I did the evening work and read the papers. I had another letter from Will today.